This time of year we are reminded to be thankful. I am truly thankful that I am alive today. At the beginning of this year, I questioned whether or not I would make it through the year. I was tired all the time, I wanted to sleep all the time, never felt really great, was eating Tums like candy, had almost constant indigestion, bloating and lots of gas that would get trapped inside my body and I was having trouble sleeping at night. What has changed? Me! I am forever thankful to a friend who suggested that I get a stress test because that suggestion snapped me back to reality! I was really not well and others could see it too. I made a decision to change my lifestyle and I have not looked back. 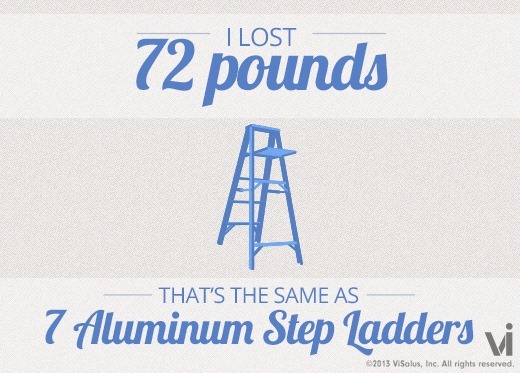 I joined Weight Watchers Online in January of 2013 and have been able to shed 73 pounds. I am not where I want to be, but, my energy level have almost returned to normal, my endurance is better, I do not want to sleep all the time, I am motivated to do things beside, eat, sleep and work! I have not had any major issues with indigestion, bloating and gas since I started controlling not only what I ate, but how much I ate. I remember in January, one of the first things I set as a mini-goal for myself was to eat one piece of fruit a day. Today, I am not happy unless I have a least two pieces of fruit on my desk and one vegetable to munch on during the day. HUGE change for me! In January, I was constantly eating some kind of chocolate candy or potato chips at work but now I have my fruit, vegetables, yogurt, etc. Do I miss the candy? Yes and no, I know I can have candy if I want it, oddly I haven’t really wanted it. The same is true for potato chips which I felt I couldn’t live without. I have found other ways to get my crunch and satisfy my sweet tooth. I am very thankful that I learned how to eat better foods and portions which has helped me to feel better and better each day. One of the side affects of losing weight, is that I not only feel better but I am looking better, feeling more confident and being generally happy all the time. I am thankful I am living, I am thankful I am living healthier! I am thankful! Today I am especially thankful that I can wear this pair of Levi’s I bought last month when I was on vacation! Yay me! I am not too good with the mirror selfies yet! 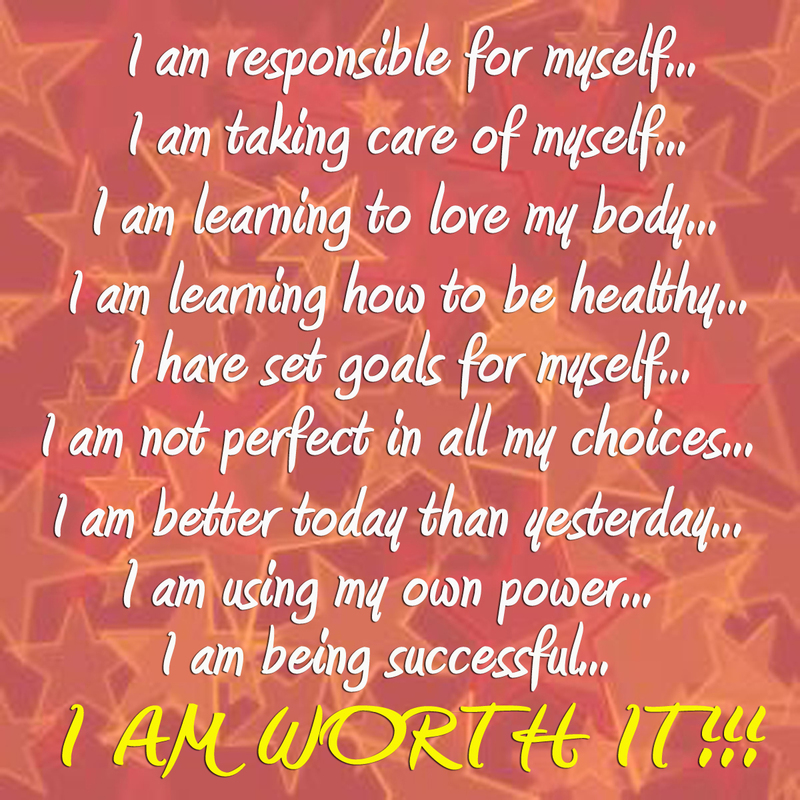 Attitude and Weight Loss – I Am Worth It! If you do not believe it can and will happen; it probably won’t! Having the right attitude before you start a lifestyle change is a key. If your head isn’t right, your body will not follow! Long term weight loss requires more than skipping desserts at a few meals, it means getting and maintaining a positive attitude. How can I boost my self-confidence? Shed that negativity!!! Negativity can slow or even stop your weight loss and sabotage your weight loss maintenance. Maintaining a negative attitude will sap your motivation, leave you discouraged, having low expectations, self-loathing, hungry and ready to quit at the smallest obstacle! Why do you want to do this? Write down all the reasons why you want to start a new healthier lifestyle pro and con. Pro, what positives will you befit from losing excess weight? What are you reasons for losing weight? Con – what do you feel has held you back in the past from achieving your weight loss goals? What obstacles do you feel you will encounter? Set a goal. Make your goal realistic and take your weight loss in small doses. I look at 5 lbs. at a time as my goal; bigger than that, I feel I get overwhelmed. Start small. Make small changes one or two a week. Such as; drinking more water, moving 15 minutes a day, eating more vegetables, eating more fruits. Making small changes that stick will go a long way to reaching your goals. Mentally visualize when your reach your weight loss goal. How will you feel at your new weight? What will you look like? What new opportunities will there be for you with this new lifestyle? Will you feel a sense of achievement, self-satisfaction, empowered and happiness? You should! Respect your body. Eliminate any “fat talk!” What is fat talk? Speaking negatively about your size and shape of your body! Become aware of negative thoughts and words about your body, shape and size. Replace them with loving self-accepting thoughts and words. Negative words have a big impact on your weight loss progress and it is believed can even increase your stress and weaken your immune system! Find some kind of movement that gives you joy! Incorporate movement into activities that you already enjoy. If you love watching movies or TV shows, add some weight training while you are watching, walking/marching in place, etc. If you love to dance, turn up the music and dance around the house while you are burning excess fat! I like to combine cleaning and dancing sometimes it makes the vacuuming more fun! Find a weight loss partner/buddy/friend. This is helpful for more than one reason. Sharing your common weight loss and exercise goals is a great way to support each other and provide that extra motivation to keep going at times when it is harder. Make a list of non-scale victories that you will accomplish. For example; wearing a smaller size, smaller BMI, lower blood pressure, losing three inches in your waist, go sky-diving, trying out a new form of exercise, wearing a different type of clothing, improving your endurance, being able to do a plank, lower cholesterol, being able to jog/run a 5K/half marathon/marathon, fitting into a waiting room chair better, getting off certain medications, wearing a smaller belt, lower blood sugar level, sleeves fitting loser on a jacket, being able to walk a mile, etc. Treat yourself! As you reach each small goal, find something you like/enjoy and treat yourself to it (non-food of course!). For example, I like to get a massage every ten to fifteen pounds, good for me and great for my skin too! I have started buying salad plates as a treat too! (Using salad plates instead of full-sized dinner plates, is a way of controlling your portions and not feeling deprived). 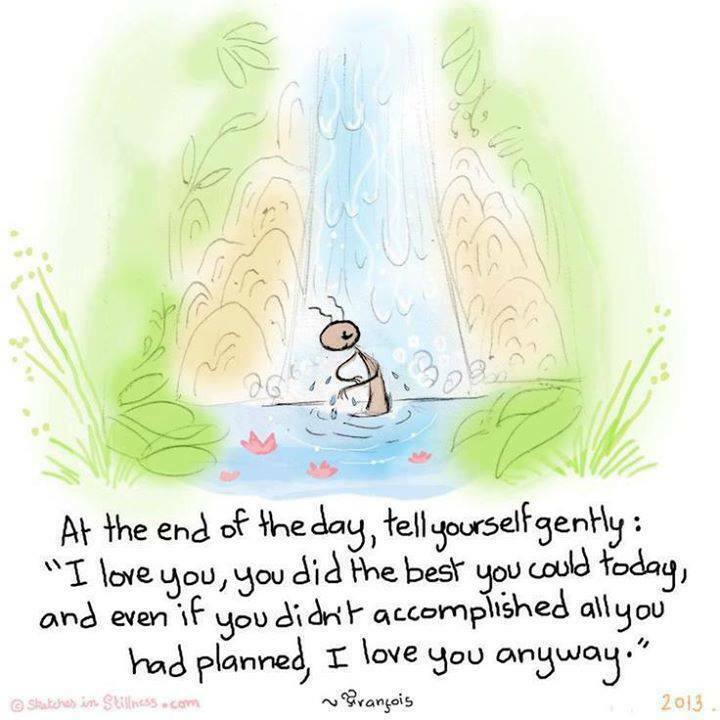 Don’t dwell on the past, be kind to yourself! When things do not go as you had hoped in your weight loss journey, do not shame yourself, own it and move on. The very next meal or snack is an opportunity for making healthy choices. 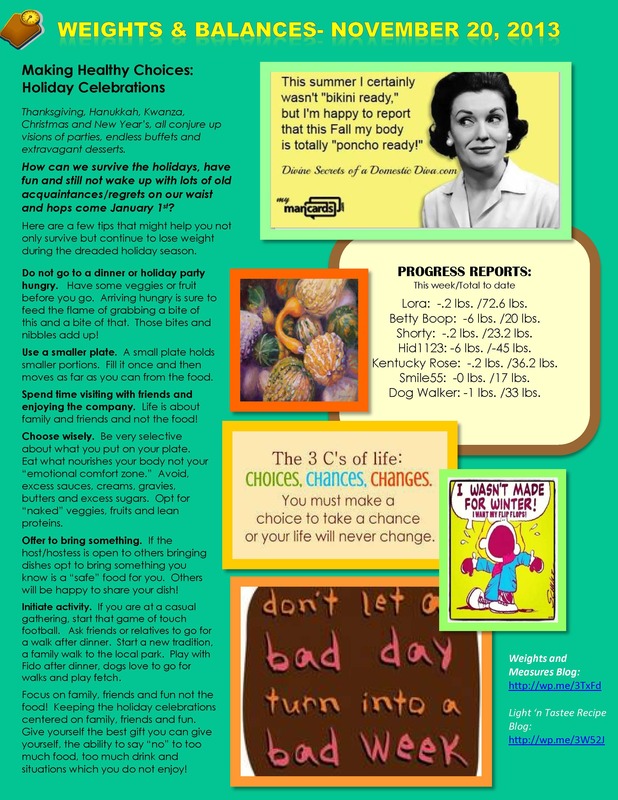 Do not feel that one bad snack, meal, day or week has to derail your new lifestyle! Keep on keeping on! Accept responsibility for yourself. No one can do this for you, no one can exercise for you, no one can make you eat anything you do not wish to eat….only you can make those good decisions. No one can make you follow the plan or count points, you have to work it out! Nothing is off-limits, know and respect your limits! If you know cookies or potato chips are foods that “trigger” you to eat too much or binge, it is simple AVOID those foods until you have more control over yourself. Think of food as fuel. You want to only put high quality fuel in your body. Avoid lower quality food sources. Choose lean protein, whole fruits and vegetables and limit processed foods. This entry today started out to be on the topic of thankfulness, which is also a positive way of living! Keeping an attitude of thankfulness/gratefulness is a another key to this voyage. There are no short cuts (machines/shots/pills/diets) to reaching a healthy weight and healthy lifestyle. Each meal/snack/workout contributes to your success. Make them all count! Keep a positive outlook and keep the positive self-talk going! You are worth it! You can and will do it! This is something I created at the beginning of my voyage earlier this year. Do you ever feel your weight loss ship has hit the doldrums? Do things feel, dull, listless? Do you feel gloomy or in low spirits? Lately I have started to feel a little “blah” about weight loss. I do not feel that spike of energy and excitement I felt at the beginning. I am not cheating on my program or eating too much food, nor have I given up, but I feel I am on auto pilot and something about that frightens me. I know I have created new habits, but I do not want to feel I have got this all figured out. Life and circumstances are constantly changing and so does our eating environment. There are a few suggestions that are given if you are starting to feel “stale” with your regimen. First, it is suggested that you allow yourself some distraction; that is good for me, I can get easily distracted! Have a mantra: Write down all the reasons for losing weight, find some inspiring pictures to post. I try to do this on a daily basis (finding inspiring pictures). It is time for me to write a new list of reasons for my weight loss! Here is my new list, most are on my original list but after ten months, it is time for a re-fresher! Have some wiggle room: Allow yourself to deviate from your routine some times. Try a new food, a new recipe a new exercise routine, shake things up a bit! I try to do this every week as well; a new food, a new recipe and try to vary my exercise. Get enough rest: Not having enough rest can affect how you view yourself, your weight loss and life in general. This one lately has been a challenge. I want to sleep when I should be working and I want to work when I should be sleeping. Hopefully this will straighten out soon! I will work through this day by day and know there are always obstacles in losing weight, this is one more hurdle to keep clearing in my weight loss voyage. 72 pounds down, 48 more to go!!! Losing Weight is like Pulling Teeth…NOT!…Well…….kind of! I recently had to have a tooth extracted and it made me think of the expression “that is like pulling teeth” and I thought is losing weight like pulling teeth…no…yes….sort of! Before having a tooth extracted usually you have gone to heroic measures to save a tooth. In my case, I had a root canal and over the course of many years two crowns. That was costly! Gaining weight is costly as well. Yes the obvious, it costs your health but it cost your pocket-book too! You have to keep buying larger and larger clothes, shoes, getting jewelry re-sized to fit, etc. I started having reoccurring gum infections and though nothing showed up on the x-ray that was “wrong” with the tooth. I was having gum inflammations and I chose to rinse more but they were still happening. Before losing weight, my shoes were often uncomfortable and too tight and I assumed my feet were just swollen a little that day. Wrong, my feet had gained weight too and my fingers! You gain weight all over even your scalp nothing escapes gaining weight. The last gum infection sent me to the dentist in search of answers and antibiotics. I was in pain one night that if I could have put my hands on pliers I would have considered extracting the tooth myself! Another x-ray showed nothing wrong with the tooth but when compared to a previous x-ray from March it showed a great deal of bone loss. The dentist concluded there must be a crack in the tooth which does not show on the x-ray and the tooth needed to come out. I was told that I could always have an implant to replace the tooth or a 3-unit bridge. My mind did not want to hear extraction but it did. I knew I had to do something. Just like in January when I had to energy and wanted to sleep all the time, I knew I had to do something to change things because this path was not a good path. The extraction took only maybe five minutes but the numbing prior and the after care last quite a while. Getting your mind set and ready to lose weight is like the preparation for the tooth extraction. You have to be given a local anesthetic so you are not able to feel the pain. Your mind has to be set so you are not easy to give up or quit when it gets harder or you hit a plateau. I found out soft cool foods were the only foods I could eat for a couple of days and could not use straws to drink out of. When I got home from the extraction, I had to start cooking/preparing soft foods that I could eat. I had to put on my thinking cap on what would be good tasty soft foods that I would want to eat. In weight loss, the time it takes to lose weight is small in relation to the time you have to take to maintain your results. Eating the right foods is the major part of the equation of weight loss. You should be thinking and planning what you are going to eat just like I had to after the extraction. The more planning and thought you put into what you are eating, the better your results will be. Brushing and flossing your teeth is a daily maintenance for your teeth, while eating properly and exercising is your daily weight maintenance. Be kind to yourself and your body!! Do your daily weight maintenance!